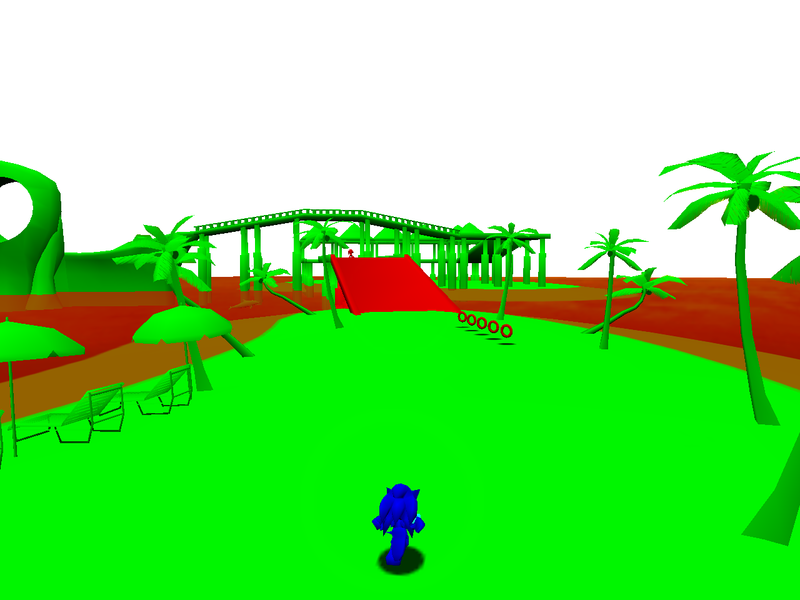 The Dreamcast version of Sonic Adventure has a lighting system (referred to internally as “LANTERN”) that uses 256-color palettes. Lighting information for each level is stored in a pair of files: the PL file (PL*.BIN) contains the palettes, and the SL file (SL*.bin) contains light direction and additional lighting information for models that don't use palette lighting. The Lantern Engine mod for Sonic Adventure DX PC is a reimplementation of this system for the PC port of SADX. Note that the sky is edited out from the above image to help visibility. The skybox ignores lighting so its textures are used as-is. LANTERN palettes are always applied in pairs to create diffuse and specular lighting. Diffuse color is the color that is calculated by multiplying the texture's color with the color in the diffuse palette. It works like the "Multiply" blending mode in Photoshop. Specular color is additive, so it works like the "Add" blending mode. Making the diffuse color brighter makes the result closer to the original texture's color. Making the specular color brighter adds to the brightness of the resulting color directly, so white diffuse + black specular is effectively the same as not applying any lighting at all, and white specular would make the vertex completely white regardless of the texture and diffuse color. Level/Object light type - Diffuse 0, Specular 0 or 1. Character/Event light type - Diffuse 2, Specular 2 or 3. Special light type - Diffuse 4, Specular 4 or 5. The majority of models in the game outside cutscenes use the level/object light type. These are the palettes you see on level pieces and objects. Character/NPC models and models used in cutscenes generally use the character/event light type, although there are some exceptions. For example, Amy's Warrior Feather and some parts of Gamma's body that are rendered as separate models (such as the laser scope) use the level/object light type outside cutscenes. The gameplay models in Sky Chase use the level/object light type despite being character-related; however, models involving the Tornado in cutscenes use the character light type. It happens the other way around as well: some non-character objects that would normally be using level/object palettes (floating meteors near the end of Twinkle Park Act 1) set the character light type so they also get character lighting, but this is uncommon. Special light type is only used by a few models in the game. Diffuse 4 and Specular 5 are used by Chaos 2, Chaos 6 and Perfect Chaos. Diffuse 4/Specular 4 and Diffuse 5/Specular 5 are also used by the transition effect in Mystic Ruins Past when the Emerald Altar is on fire. The above palettes blend between each other to create the burning fire effect. If a mesh's material has the "ignore lighting" flag (NJD_FLAG_IGNORE_LIGHT), the mesh is not palettized and the fullbright texture is used as-is. Neither the diffuse nor the specular palette is applied to the mesh, but the rest of the meshset may be palettized depending on whether or not the remaining materials have the "ignore lighting" flag. If the model's first material has the "ignore specular" flag (NJD_FLAG_IGNORE_SPECULAR), the entire model's specular palette index is the same as the diffuse palette index (e.g. Diffuse 0, Specular 0). 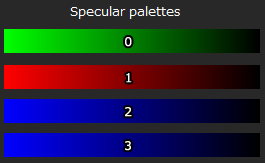 If the model's first material doesn't have "ignore specular", the specular palette index is the diffuse index + 1 (e.g. Diffuse 0, Specular 1). Note that only the first mesh's material in the model affects specular palette selection, and all other meshes follow it regardless of whether they have "ignore specular" or not. 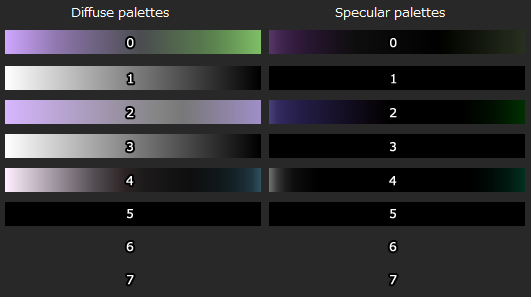 Specular palette selection is consistent within a single model, but if the model has child or sibling models those are processed separately unlike the light type. So it is possible to have a model (e.g. Tails) that has child models with a different specular palette (Tails' shoes). 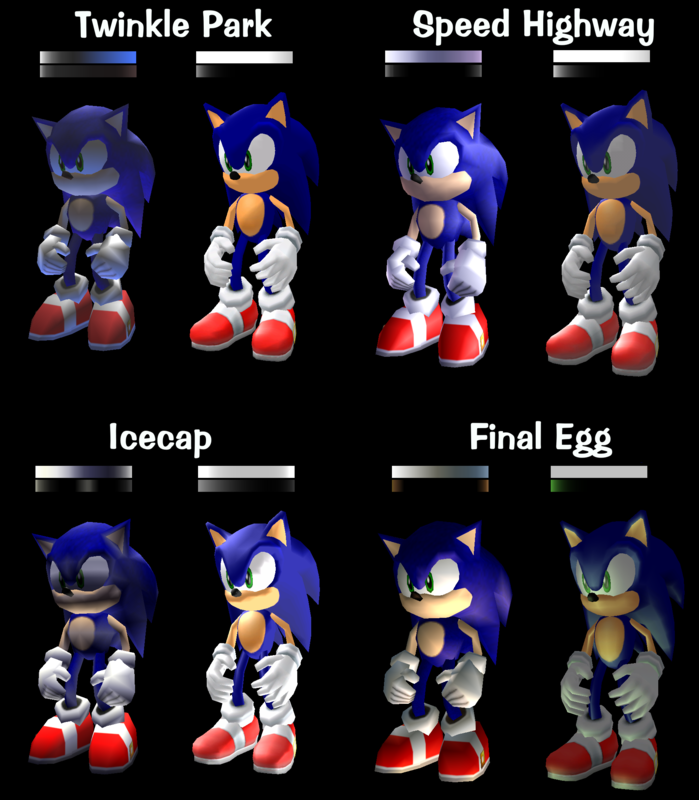 They would still use the same diffuse palette, however, as they would have the same light type as the parent model. Sometimes the game forcibly adds or removes the "ignore specular flag" on some models or sets the a specific light type, in which case you would need to change/disable the code doing that, or use Lantern API to register those models' materials for arbitrary palette selection. This may have been unintentional, but if a mesh in a model has a material with the "ignore lighting" flag, the remaining meshes after it may get the fullbright diffuse palette (as if they were ignoring lighting), but keep the specular palette. The Lantern Engine mod does not do this by default, although Dreamcast Conversion level mods have this implemented manually in the API for better accuracy against the original game. The Past fire effect blends between Diffuse 4/Specular 4 (which are used in place of Diffuse 0/Specular 0 for the level/object light type) and Diffuse 5/Specular 5. The Lantern Engine mod blends between Diffuse 0/Specular 0 and Diffuse 5/Specular 5 instead, which makes sense because Diffuse 0/Specular 0 and Diffuse 4/Specular 4 palettes are identical in the PL file anyway. Sky Deck Acts 1 and 2 blend between palettes in PL_60B.BIN and PL_61.BIN. PL_60B is used normally, and PL_61B is used when the Egg Carrier descends into the clouds and everything gets dark. The Egg Viper boss fight blends between palettes in PL_M0B.BIN and arbitrary colors (red and cyan). 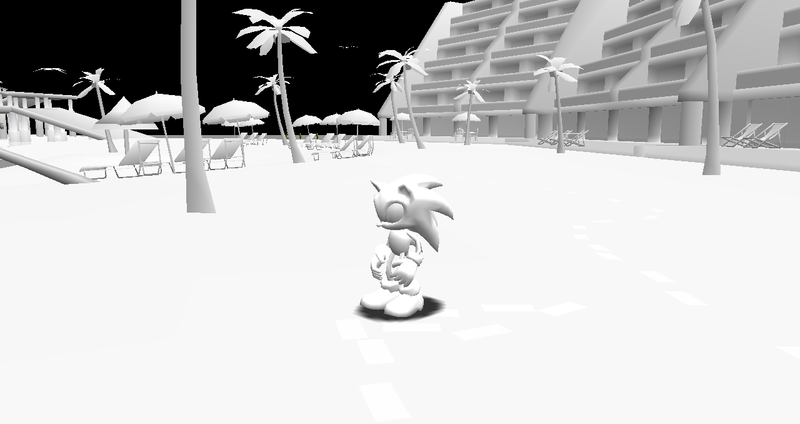 In Casinopolis Act 1 going to the machines that transport Sonic to pinball areas blends the character specular palettes with white, making character lighting brighter as Sonic is floating and rotating before getting teleported to the pinball field. PL_9MB.BIN - An alternative version of the Casinopolis sewers palette that is never applied, but it was originally supposed to be used by an object called MUD. The object would change Sonic's specular palette to make it less shiny. Light direction adjustment: SL files contain Y and Z rotation values that are applied to the default light direction, which is a downward facing vector. Lighting configuration reserved for models that don't use lighting from PL files. This information consists of: light color (RGB floats), diffuse multiplier, specular power and ambient multiplier. The "SL lights" configured for the above objects use the same light direction as the palette lights. Both diffuse and specular lights are the same color. PL Tool provides a visualization of this lighting data, but it is only a rough estimate because SL Lights do not use palettes, and because "SL objects" have an additional set of lights that is configured outside the SL file. Note: the "ignore specular" material flag disables the specular SL light for the mesh that has it. The SL lighting system is currently not implemented in the Lantern Engine mod. In addition to the above, non-palettized models have another set of lights mixed with the SL lights. These additional lights appear to vary between stages, and their data has not been found in SA1 yet. The additional lights consist of a diffuse light (with an ambient value that brings up the overall brightness of the light) and a specular light, both of which use a fixed light direction that is independent of the default light direction and the data in the SL file. This type of lighting is currently not implemented in the Lantern Engine mod. As the data for these lights is likely located in 1ST_READ.BIN or level binaries, PL Tool cannot edit them.